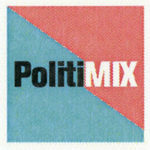 Politics can be tiresome, but politMIX is something else entirely! The first MIX of 2014 is a monster of music, mingling, malt, masala, and municipal election mayhem! FREE finger-licking, soul-saturating Ayurvedic appetizers by Annapurna’s World Vegetarian Cafe! Delicious, brain-soothing beers and beverages courtesy of Duel Brewing! As always, fill out our quick survey (either at the door or online: http://bit.ly/1mgtHuf ) and your first drink is ON THE HOUSE. DJ SunnyCyde will calibrate your cortex with cerebral, loop-based electronic mind melodies AND The Maya Spectra will put in a live performance! This SFUAD-based shindig is going to (figuratively) put the arson in Greer Garson Theater AND it’s going to put MIX-style heat to the politicians’ feet when mayoral candidates Patti Bushee and Javier Gonzales dust up on stage for a debate to help you decide who’s going to build a better, bolder Santa Fe! Julia Goldberg, host of the Julia Goldberg Morning Show on KVSF 101.5 will moderate and generally move the candidates to MIX it up. The debate will be broadcast live on KVSF 101.5, 98.1 Radio Free Santa Fe and KTRC 1260 am. Also, to elevate the electoral enthusiasm, MIX will be releasing the first phase of a policy project in which the data we’ve collected from YOU over 4 years and 43 events takes the form of strategic policy suggestions and concrete ideas about making the change YOU’VE been asking for. politiMIX has extended hours so that you can grab your grub, sip your suds before catching THE ONE DEBATE YOU MUST NOT MISS, and then get back into your groove to dish and discuss. Smart candidates will stick around to follow-up and grab a tasty brew. As always, MIX is a private event and YOU and YOURS are invited. FREE FOOD and DRINKS are available while supplies last! PolitiMIX Survey Results are in!